Hanuman Bahuk is a wonderful and highly interesting stotram composed by Tulsidas in praise of Hanuman. Tulsidas was very much moved to see the sufferings, health issues, and pains the people. In order to help the people of the age of Kali, Tulsidas wanted to give them a mantra that will cure all their illnesses and problems. The result was Hanuman Bahuk. Hanuman Bahuk is one of the most powerful companions of the people to escape all the ills and problems of modern life and win the blessings of Hanuman for good health and happiness. Below we have Hanuman Chalisa Lyrics in Hindi, Hanuman Chalisa Lyrics in Engish with their meanings and PDF Files so that you can download it for free. We also have Hanuman Chalisa MP3 and Hanuman Chalisa Path Video! These are the core benefits of reading Hanuman Bahuk. We hope that it will help you in getting rid of your illness and live a healthy life. 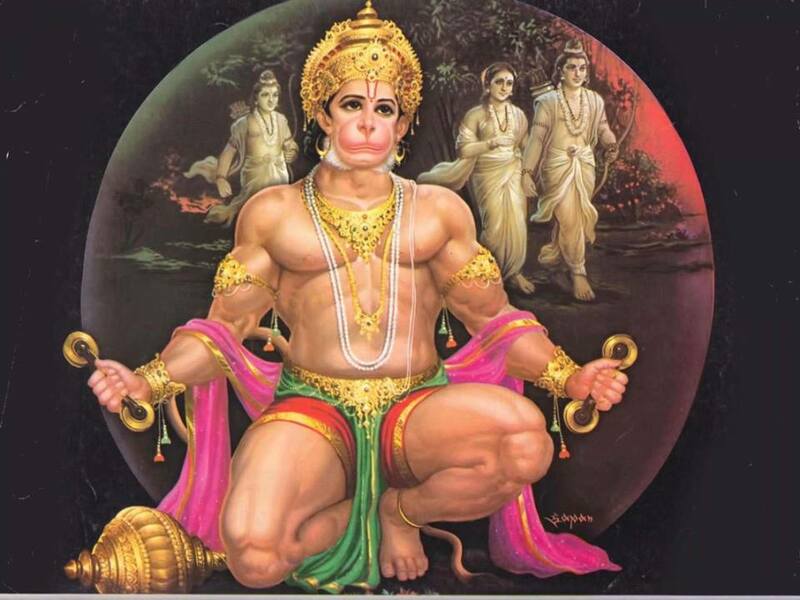 How to Chant Hanuman Bahuk? The Hanuman Bahuk Path consists of 44 verses. It’s recommended to perform this puja on Tuesday & Saturday. Before reciting the mantra, make sure to get blessings of Lord Ganesh by chanting ॐ गं गणपतैय नमः. Place picture or idol of Lord Hanuman and Rama next to each other and light a lamp or diya. Take some clean water and place it in a copper vessel next to the picture or idol of Hanuman. Start the puja and after reciting Hanuman Bahuk. When chanting is finished, the water you have put int the copper vessel has been charged with the Hanuman Mantra — drink it. You will see positive results soon. Put water every day before chanting and drink it up after chanting. Plase, note that you should try to eat vegetarian food and abstain from alcohol for few days before and after you recite Hanuman Bahuk. Lord Hanuman is famous for his immense devotion towards Lord Rama. He saved lives of many but the most widely known story is of Lakshman, brother of Lord Ram. Hanumanji got the ‘Sanjeevani Booti’ to save Lakshman’s life. By virtue of this, whoever worships Hanuman, will be able to get rid of all their problems. It is believed once Tulsidas had great pain in one of his arms. He was treated to the vaidyas (doctors) and he did many things to cure it; the pain couldn’t be cured. At last, when nothing worked, he wrote Sanskrit verses fo Lord Hanuman. And finally, after this, his pain was cured. Those Sanskrit verses were called Hanuman Bahuk. Since that time, Vedic Brahmins use to chant Hanuman Bahuk to stay healthy and get rid of serious diseases. Hanuman Bahuk has a special power of providing relief from physical as well as mental illness.